Yes, it’s true. The Tennessean has for the moment decided it will allow one company affiliated “blog” to exist apart from its core site at tennessean.com. Hosted on Google’s blogspot platform, the site’s content centers around the hottest topic at the moment — the 2008 Presidential Election. If you did not immediately catch wind of the breakthough then you are not alone. It was started about a month ago under the sort of generic name of “tnelection” [http://tnelection.blogspot.com/] and even if you stumble upon the site itself you may not have realized it immediately. It bears striking resemblence to The Tennessean’s own design, which made me do a double-take while switching through tabs on my browser. The man responsible for this miracle of convergence is a former MTSU J-school classmate of mine, Colby Sledge. A few people may read this post and say “OK big friggin’ deal. It’s just Blogspot and WordPress is way better anyways.” I can sympathize with that notion because I’m no stranger to digital news flow and Blogspot is just the tip of a very, very big iceberg. However, I have to argue that this is probably the most important development for converging our big local metro paper into a mighty voice who represents the audience it reports on. To do that you have to give them the news in ways they prefer it. Blogspot is that medium. The Blogspot site is also significant because it brings The Tennessean’s convergence effort full circle. All too often people make a big deal about the technology and merging of mediums being used to facilitate better coverage, but what never gets mentioned is the core principle behind the Internet: Sharing. If you use a blogging platform, then you’re experience a form of sharing. Google, WordPress, Flickr and many other sites are free to people like us, but it costs those companies money to run it. So in essence, they are sharing the tools and in turn we share our ideas. Money is made on both sides of the fence through advertising. None of this would be possible without sharing. If you don’t share, we have no Internet. So The Tennessean decided to share its credibility, its content and its most valuable resource, Mr. Colby Sledge. From my understanding, getting the blogspot site approved by management wasn’t just a rarity, it was the first and only time they’ve allowed this to happen. Despite the benefits of using a blogspot account to push information out, none of the gurus or experts of Internet media were able to accomplish what Colby did. He is neither of those things when it comes to social media. What he did have was respect. 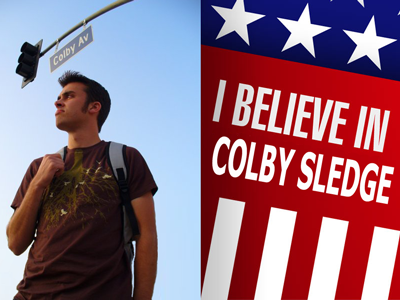 Colby is a rare pillar of moral integrity 24 hours a day, 7 days a week– not just inside the newsroom or when someone reads a report he’s published. I can’t think of a single reason someone would dislike him other than the fact that he’s so good at walking the line that people assume its not real (*ahem* MrBabyMan). What I’m trying to say is, we have to stop picking on the ignorant, labeling the stubborn and calling the veterans of our industry “curmudgeons” if we ever expect a real change to mass media. So from now until the end of the election I’m going to read Colby’s efforts via blogspot and I’m going to comment as much as possible. I’m going to spread the word because if the community doesn’t get behind this little experiment, it could disappear after the next President is voted into office. And then friends, we’re stuck with corporate technology initiatives (Pluck) or we’re left searching for an alternative big local news gatherer that does not yet exist. This entry was posted on Thursday, October 2nd, 2008 at 7:01 am and is filed under Journalism. You can follow any responses to this entry through the RSS 2.0 feed. You can leave a response, or trackback from your own site.